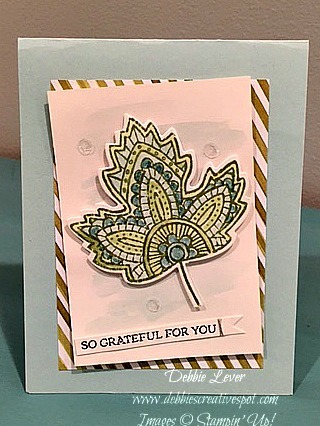 In a recent class I held we used the Lighthearted Leaves stamp set and colored the stamped images using a Blender Pen. This stamp set is perfect for coloring. I chose a soft color scheme of Soft Sky, Pear Pizzazz and Smoky Slate. The white card stock is Shimmery White cardstock. It has a beautiful shimmer to it and is perfect for watercoloring. For this design, my card base is Whisper White Thick Cardstock and the Shimmery White Cardstock is used as a layer. I love how it looks! 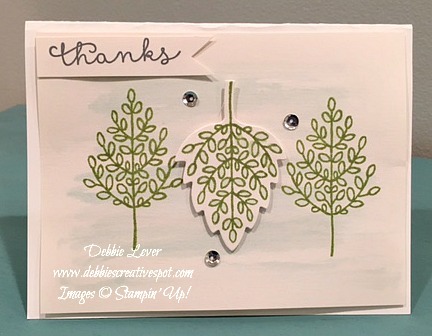 A simple design and although it is hard to see, I used an Aqua Painter with the Soft Sky ink and did a wash on the card front. 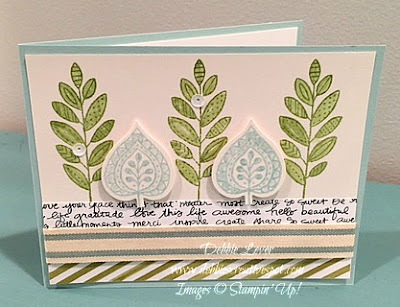 You do need to be careful that the card dries before stamping on it or the image will run. This design was the inspiration for the set of cards. I saw it on Pinterest, designed by the very talented Teneale Williams. I changed it just a bit. The leaves were cut using the Leaflets Framelits for the Big Shot. How easy is that! My Stampin' Up! Supply List. Click on Product Image for Details and Easy Online Shopping.